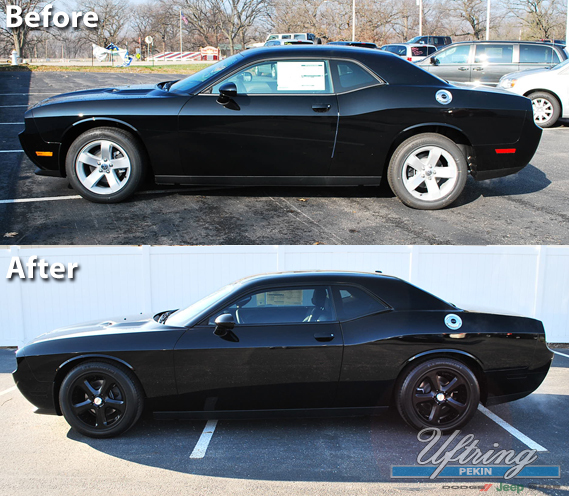 Steve Porter, General Manager at Uftring Chrysler Dodge Jeep Ram in North Pekin, Illinois, recently told his service and parts team to put a coat of "awesome" on this Dodge Challenger. We all know the Challenger is a real head-turner without these sweet additions . . . but now it's turned into something much more sinister and breathtaking. You could say it looks mean, but that's not quite accurate either. Intimidating, perhaps? At any rate, we added custom wheels and tires, lowered it, added tint to the windows and created a serious street legal street rod. Check it out and call us for a test drive at Uftring Chrysler Dodge Jeep Ram - Route 29 in North Pekin.